Is it possible to completely disable the map? Is it possible to turn off quest notifications completely? Opps,I just realize you asked for DDO forum and not for Lotro,sorry, but just incase I'm leaving the info if you were actually asking for Lotro and not DDO. I assume the mini map? 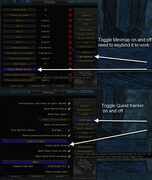 You can turn those feature off in the ingame options,just that the minimap you need to keybind it to work. Last edited by Brygard2007 : 02-14-2010 at 03:12 PM. friends I just simply understand people wanted DDO online community and never intended for Lotro, apologies, yet only incase I'm leaving the data if you had been really trying for Lotro and never DDO. *Play Online Free solitaire Game Visit site solitairewithbuddies.com Play Free Classic Solitaire Card Games Online For more Details*.